Have you ever wondered “should my dog wear sunscreen?” when you’re enjoying time outdoors on a hot day? Especially if you’ve headed to the beach and have put your own sunscreen – what about our dogs? Can they get sunburnt as well? Vets say yes: dogs can and do get sunburnt with a risk of it leading to skin cancer. And some dogs are at higher risk of UV damage from the sun, just as some people are. Light skinned and lightly furred dogs are at highest risk of sun damage to the skin. Most dog sunscreens are rated to around the equivalent of SPF 15 human sun protection products. This sounds low compared with the sunscreens we can now buy for ourselves that are rated at SPF 50 or more – but these (and all sunscreen for people regardless of their rating) contain ingredients that are toxic to dogs. Therefore, no human sunscreen product should ever be used on a dog or any other animal. I’ll cover all four in this guide. While they all, in theory, provide the same protection, your choice simply comes down to what sort of application you and your dog are most comfortable with. Some people find a spray more convenient, while others much prefer wipes or a balm which can be applied more accurately to a specific small area. 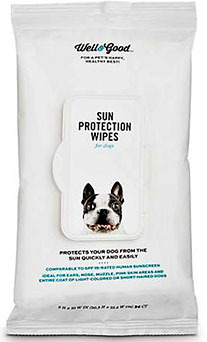 Rather than battle with a cream, wipes provide another option for easily putting sunscreen on a dog – without a mess and without the risk of getting more into their eyes and mouth than where you actually want it to go. Wipes have a lot of benefits, including those mentioned above. Products like Well & Good Sun Protection Dog Wipes are rated to provide a similar level of sun protection as human SPF 15 sunscreen and the wipes are completely safe to use on all those exposed skin areas: ears, nose, muzzle and anywhere else your dog needs protecting from the sun’s UV rays. Like wipes, a stick applicator makes it really easy to put sunscreen on small and specific areas without missing the spot: near the nose and on the ears for example. The Petkin dog sunscreen Sunstick is one of the few canine sun protection products of this type. Small enough to fit in your pocket, this is one of the most popular sunscreens I’ve looked at. People want convenience and the sunstick provides that: take it anywhere, it’s unobtrusive and makes no mess. A sun shirt provides some extra sun protection for dogs who have thinner fur, or exposed skin areas on the body – a good shirt should protect along the back, chest and stomach – while also being waterproof. Think of it as a dog swimsuit. The EzyDog Rashguard is a good example of this sort of dog sunshirt.